Fit Fluential Mom: This Scale IS My Friend! So, most of you know I'm NOT a big fan of scales but the bottom line is, to keep your goals in check you NEED one. And hello.....New Year's Resolutions are around the corner so I'm sure you're all thinking about those goals too! I don't weigh myself every day but I do weight myself a few times a week to monitor myself and stay on course. Up until a few months ago, I've had a regular scale that just read weight. Weight is fine and all but it's best to have the big picture! Weight PLUS body fat, muscle mass, bone density, water and BMI truly define your progress and give you an accurate picture of your fitness. The number on the scale when it comes to weight alone is NOT a good representation of your progress. That's where the EatSmart scale comes in! 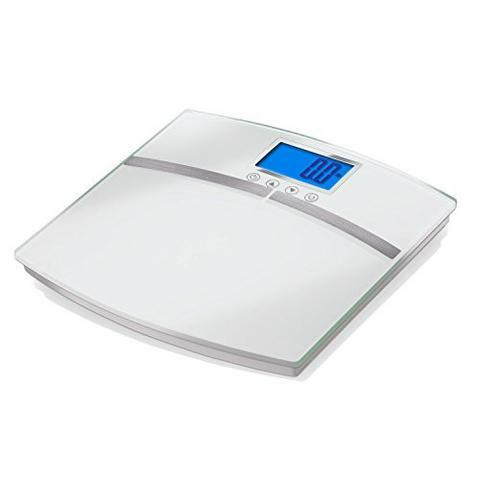 I got this scale, the Eatsmart Precicion Body Fat Scale Bathroom Scale w/ 400 lb Capacity and Step Off Technology, and now I don't even care what the number says when it comes to weight! I'm more concerned with muscle mass, fat percentage and my BMI. And I can see that every time I step on it and every time my husband steps on it as well. Below are a few shots of the scale and the different screens and information it shares. The scale can hold up to 8 different user profiles and will recognize users as they step barefoot on the scale. So, if you're on a weightloss or weightgain journey of your own, this is definitely a good investment. It retails for over $59 but it's on sale now for $24.95 so jump on it!